Magdeburger Joe.com: Is Alan Grayson Nuts? In my book of politics, whoever wins the satire battle, gets a ton of bonus points. Back in the 60's, the Smothers brothers used to skewer Lyndon Johnson and later the Nixon administration. Even if you were a supporter of either President, the Smothers brothers were brilliant. In the Soviet Union and the former communist bloc, underground jokes were part of the weaponry of an outgunned and suffering populace. There was an East German poet named Wolf Bierman who once wrote that a government that has lost confidence in the people should dissolve it and elect another. There is a congressman in Florida who most embodies that grotesque caricature at least as well as anyone on the current political scene. 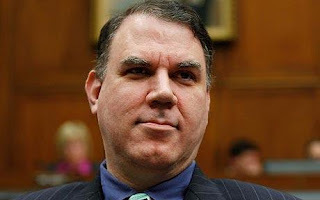 Alan Grayson is a representative of Florida's 8th Congressional district. He has stacked "town hall meetings" and otherwise attempted to steamroll opponents in his congressional district who oppose his stand on a deeply controversial health care bill. Up until now, rude disrespect for constituents has been the order of the day. Now he is trying to have an opponent jailed, filing charges that could have her jailed for five years. Fox News reports as follows on Alan Grayson's latest and most disturbing temper tantrum. Rep. Alan Grayson, D-Fla., is asking U.S. Attorney General Eric Holder to launch an investigation into a Web site launched by a Republican activist that parodies his own re-election site. My, my, my. Florida Rep. Alan Grayson wants to see one of his critics go directly to jail -- all over her use of the word "my." In an effort to raise money against the outspoken freshman Democrat, a Republican activist named Angie Langley has launched "mycongressmanisnuts.com" -- a Web site that parodies Grayson's re-election site, "congressmanwithguts.com." Langley criticizes Grayson on her Web site for his "inappropriate behavior" and "childish approach" toward governing, and claims he "does not represent the values of central Florida." She said in an interview with Fox News on Tuesday that she launched the site in an effort "to expose him (Grayson) for what he is." But Grayson is not amused, and he is asking U.S. Attorney General Eric Holder to conduct an investigation into the Web site and Langley, according to a report in the Orlando Sentinel. In a four-page letter sent to Holder, Grayson accuses Langley of lying to federal elections and requests that she be fined and imprisoned for five years. Her lie, according to Grayson, is that she claims to be one of his constituents. Langley, Grayson says, is misrepresenting herself by using the term "my" in the Web site's name. Langley is a resident of Clermont, Fla., which is outside Grayson's 8th District. Oh, my. "Ms. Langley has deliberately masqueraded as a constituent of mine, in order to try to create the false appearance that she speaks for constituents who don't support me," Grayson writes in his complaint. "[She] has chosen a name for her committee that is utterly tasteless and juvenile." Lets see if we can understand this correctly. Eric Holder, who refused to investigate blatant intimidation of white voters in Philadelphia in 2008 is now being called upon to investigate a satirical web site launched by someone who had grown up and leaved close to where Alan Grayson maintains his imperial palace. The internet makes it possible for anyone to launch biting satire without the help of the mainstream networks. Langley mimicked the graphic style of a pompous and arrogant congressman, even structuring the web page with a similar layout. "My Congressman is nuts!" happens to be protected political speech. Her style reminds me of a raucous underground newspaper that circulated in my high school in the late 60's. Grayson reminds me of nothing as much as the brittle targets of the underground newspaper I so fondly remember. In asking that Langley be jailed on the basis of the pronoun "my" he has forever lost the comedic high ground. He is like the proverbial substitute teacher who loses it in front of a class full of restless students. He can not win. He has already exposed himself as an enemy of free speech and political satire. If Eric Holder files charges against him, it will file a national spotlight on a local debacle. And if Eric Holder refuses to act, it will expose Grayson as being so totally out of the American mainstream that he is willing to criminalise political speech. Already, the legal implications cut across local boundaries. I have examined the evidence. Alan Grayson is nuts. He is also an idiot. Eric Holder, come prosecute me.